The mouth needs saliva to be able to work properly. Saliva keeps our mouth moist, and it helps digest food. It also acts as a cleanser and has a buffering capability that counterbalances the acidic environment created by acid fermentation. Dry mouth or xerostomia is a condition which affects the flow of saliva, causing your mouth to feel dry and uncomfortable. At times, xerostomia can make it difficult to speak and may lead to malnutrition. Extreme dry mouth and salivary gland dysfunction can produce significant and permanent mouth and throat disorders and can impair a person's quality of life. What causes dry mouth ? Many prescription and non-prescription drugs can cause dry mouth. These include drugs used to treat depression, anxiety, pain or allergies (such as antihistamines), drugs against obesity, epilepsy and hypertension (diuretics), muscle relaxants and sedatives, certain bronchodilators and Parkinson's disease medications. Other causes of dry mouth are radiation treatments to treat cancerous tumors of the head and neck. Dry mouth can be a side effect of medical conditions, including salivary gland diseases, Sjogren's syndrome, HIV, Alzheimer's disease, diabetes, anemia and others. Eating disorders, such as bulimia and anorexia, are other risk factors for developing xerostomia. Salivary production can be decreased if a major salivary duct becomes blocked, such as from a stone or infection. Other causative factors include stress, anxiety, depression, and dehydration (for example, in case of fever, excessive sweating, vomiting, and burns). Surgical removal of the salivary glands (for example, in case of salivary gland tumors) is another cause of dry mouth. Dry mouth can also be a result of nerve damage to the head and neck area from an injury or surgery. Smoking or chewing tobacco can affect saliva production, while breathing with your mouth open can also contribute to the problem. 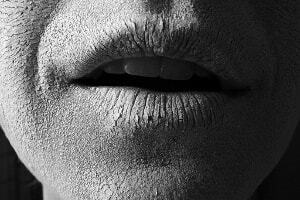 People with dry mouth may have trouble speaking, eating, tasting food, and swallowing. A sticky, dry feeling in the mouth and throat, frequent thirst and bad breath are also common symptoms. Because of the lack of saliva, the usual signs of dry mouth can include a dry, red, raw tongue, sores or split skin at the corners of the mouth and cracked lips. Dry mouth also increases a person's risk of gingivitis, tooth decay, and mouth infections, such as thrush. A white tongue can be an indicative of a fungal infection like yeast (candidiasis). Dry mouth can make dentures difficult to wear. How is dry mouth treated ? It is important to determine the underlying cause of dry mouth. First, you'll need to talk to your doctor about any medications you are taking since some of them may be responsible for your dry mouth. The doctor may adjust your dose or prescribe a different drug that doesn't cause dry mouth. Meanwhile, you can take other steps that may help improve saliva flow. Some of them will aim to stimulate salivary flow from the glands while others will act as saliva substitutes. It is important to remember that dry mouth increases the risk of gingivitis, tooth decay, and mouth infections, so prevention of caries or candida infections should be an important goal.